SUMMIT COUNTY — Predictions make long ago about lynx movement in Colorado are turning out to be true, as the wild cats explore new territory north of Interstate 70. Photo credit: Tanya Shenk/Colorado Division of Wildlife. 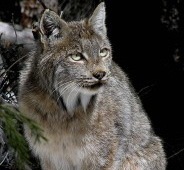 Summit County is part of an important north-south movement corridor for lynx. In a study released in March, Colorado Parks and Wildlife researcher Jake Ivan documented and described lynx movements across Interstate 70, long thought to be an impediment to northward dispersal. While a few lynx have been killed trying to cross the busy interstate, many more have made it across — and back again — successfully. Knowing when and where the threatened mammal cross highways is important, because it will help decision-makers charged with finding the best locations for wildlife overpasses and underpasses, as well as managing lands along the highways. Lynx are also crossing major highways in other areas. A female made repeated excursions across Highway 91 in the vicinity of Copper Mountain and Mayflower Gulch, according to White River National Forest biologists. 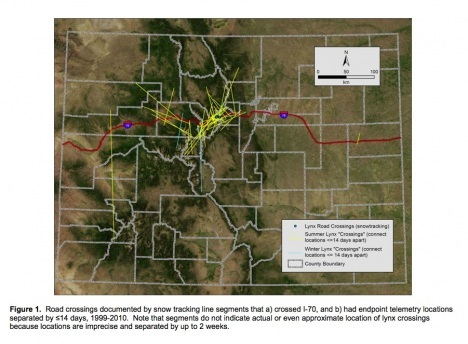 To map the crossings, Ivan used data spanning 1999 to 2010 from both reintroduced and Colorado-born lynx. Some of the location data is derived from satellites and some from daytime overflights using fix-wing planes. More information came from snow-tracking, with field observers reporting precise GPS data for locations were lynx crossed roads or trails. Altogether, Ivan documented 80 I-70 crossings, with the bulk of them (39 percent) in a 10-mile stretch between the east entrance of the Eisenhower Tunnel and Bakerville. Thirteen crossings (16 percent) were from the east entrance of the tunnel through the Loveland Pass Linkage Zone, and 12 more (15 percent) passed through the Vail Pass Linkage Zone. Most crossings (64 percent) identified via telemetry occurred during summer months. According to Ivan, all but one of the 52 crossings documented by winter snow tracking were in the reach between the east entrance of the tunnel and Bakerville. Another limitation is that the data obtained during airplane overflights was gathered during the day, when lynx are least likely to be on the move. The overflight data also was biased toward the winter months, when field work was most intense, whereas lynx are more likely to make long-distance treks in the summer. Ivan said the winter snow tracking was also biased toward the Herman Gulch linkage area because evidence suggests that is a high-use area.